Histories of the National Mall | How are large objects displayed in the museums? Displaying large objects is a challenge for museums on the Mall. Over the years, museums have used space outdoors, created special doors, and even built a museum around large artifacts. Objects like the Apollo 11 landing module at the National Air and Space Museum and the T-Rex skeleton at the National Museum of Natural History require special care and accommodations to keep them available for interpretation and visitor enjoyment. Displaying large objects indoors is a challenge, so some museums exhibited them outdoors. 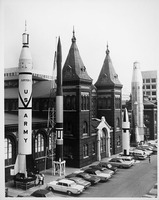 Before the Smithsonian National Air and Space Museum was built, military missiles flanked an entrance to the Arts and Industries Building in the 1960s. This approach was not ideal for long term item display, because objects exposed to the elements can be easily damaged. Knowing that the Smithsonian National Air and Space Museum would be filled with aircraft and space vehicles, architects designed large windows throughout the museum. The visual effect brings the sky to flight-themed exhibits, and the windows also open to help curators and exhibit specialists move the museum’s objects. The west window bays are shown here open to welcome a Spitfire airplane from World War II arriving in 1975. Most of the Mall’s museums do not have windows that serve as doors. Before the Smithsonian National Museum of American History building opened, this 1926 American Locomotive Company railcar drove into the museum. 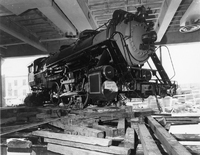 Seen here moving in along a specially constructed track, the train was led into the Railroad Hall on the first floor before the museum’s exterior walls could be finished. Moving objects short distances between museums can also pose big problems. 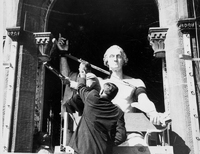 In 1962, Horatio Greenough's statue of an enthroned George Washington moved one half mile from the Smithsonian Castle to the National Museum of American History. The museum crew propped the 12-ton statue on bricks so that it could be transferred by crane onto a flatbed truck. To get the statue outside, all the glass and several bricks were removed from a window because the doorways were too small. The statue traveled safely across the Mall. Sometimes exhibiting large objects indoors present physical challenges on a museum’s structural integrity. 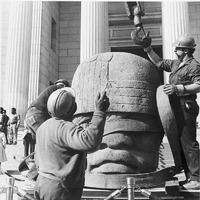 In 1978, the Smithsonian National Museum of Natural History hosted an exhibit on ancient Mexican life, art, and culture. Smithsonian exhibit specialists worried that this 5-ton stone sculpture from the Olmec civilization might fall through the exhibit floor. The museum’s staff built a special steel frame platform within the exhibit to protect the object, the museum, and visitors.